In good hands: gemelli rustica. For all its artisanal allure conjuring images of La Nonna coaxing magic from dough with hands creased by the wisdom of generations, sugo stewing on the stove for hours in her small Tuscan cottage, great pasta comes down to simple math. These grandmas of the Old World know the formula. It’s imprinted in their memory bank, a kind of skill that doesn’t come easily, that is to say, quickly. It’s slow food in the strictest sense. 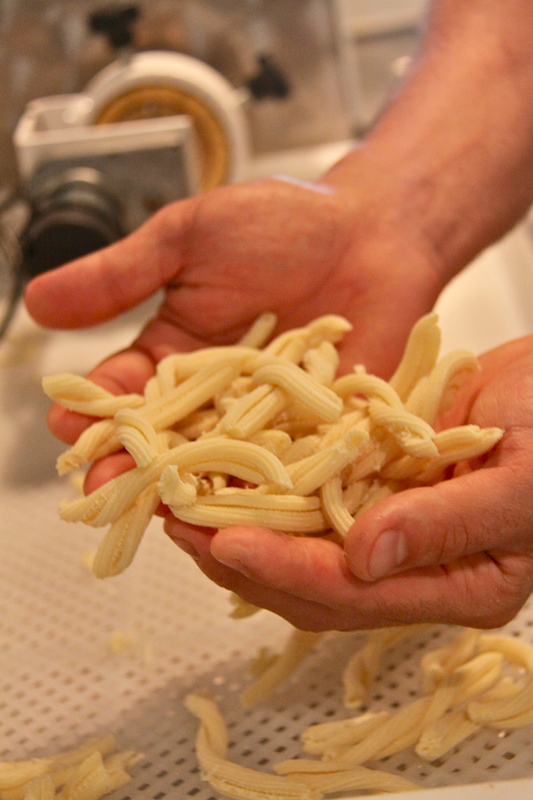 The Lancaster, PA-based manufacturer Arcobaleno, Italian for rainbow, has captured this essence of perfect pasta and made it available in a machine. One specimen now calls Michael’s Genuine Food & Drink and the Design District home thanks to Michael, to the joy of the kitchen crew. The machine works as a kneader and extruder, using lead-heavy brass attachments as thick as hockey pucks to force freshly-made dough through a pattern of holes, each specific to a pasta shape. The brass is somewhat porous, responsible for the rough finish to the ridged shapes (“perfect for catching sauce”!) This metal also requires gentle cleaning; Bradley soaks them in water only, loosening the dough and preventing the absorption of unwanted clingers-on. Michael was turned onto Arcobaleno by our friends at Philly’s master pasta-making restaurant group, the Vetri Family. Under the tutelage of chef Marc, his team including chef Jeffrey Michaud, have lived and breathed Italian culture and cuisine, especially in their home away from home, the northern city of Bergamo, taking sometimes more than annual trips for inspiration and education. “Arcobaleno makes a mean pasta extruding machine and hasn’t let us down in 10 years. I would recommend this to anyone who is serious about making pasta!” Jeff says. Just check out his spread at the chefs’ party that Osteria hosted for last month’s Great Chefs Event in support of Alex’s Lemonade Stand. Serious pasta doesn’t even begin to scratch the surface! Our unit arrived about a month ago and has already been a game changer for chef de cuisine Niven Patel and sous chefs Jason Arroyo, Daniel Ramirez, and Manny Arredondo; it’s not only that you can taste the difference. I still can’t believe I haven’t tried it yet!!!! Needs to happen ASAP!